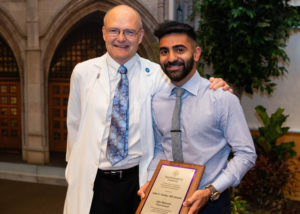 Ajay Haryani, ’18 MD, was presented with the John T. Clarke, MD, Award by David Neely, MD, ’85 GME, associate professor of Medicine in the Division of General Internal Medicine and Geriatrics. Photo by Nathan Mandell. Feinberg faculty and fourth-year medical students gathered to recognize clinical and academic achievement at the sixth annual Honors Day, held May 18. After graduation, Haryani is moving on to a residency in internal medicine at the University of California-San Francisco. The ceremony opened with remarks from Eric G. Neilson, MD, vice president for Medical Affairs and Lewis Landsberg Dean, who welcomed faculty, family and graduating students to the event. 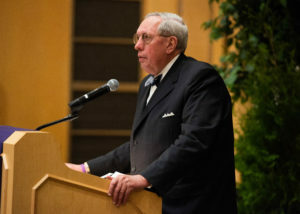 The ceremony opened with remarks from Eric G. Neilson, MD, vice president for Medical Affairs and Lewis Landsberg Dean, who welcomed faculty, family and graduating students to the event. Photo by Nathan Mandell. Diane B. Wayne, ’91 MD, vice dean for Education, Dr. John Sherman Appleman Professor and chair of Medical Education, presented awards to four faculty members for their outstanding teaching and mentorship. “We’re recognizing revered, long-time faculty, as well as some new scholars,” Wayne said. Taylor Sutcliffe, ’18 MD and class president, introduced John Franklin, MD, MSc, ’14 MA, associate dean for Diversity, Inclusion and Student Support and chief of Addictions in the Department of Psychiatry and Behavioral Sciences, as the Harry N. Beaty Honors Day Speaker. “This year’s speaker has been one of our most engaging teachers, a role model for humility and kindness and a tireless advocate for mental health and wellness in the student body,” Sutcliffe said. Franklin discussed the importance of respect for others in the practice of medicine. 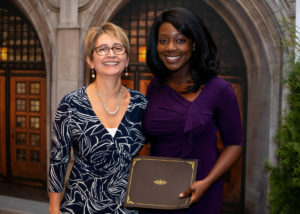 Beverly Aiyanyor, ’18 MD, was presented the Neil Stone Award for Professionalism and Compassion in Medicine by Sandra Sanguino, ’93 MD, MPH, ’96 ’99 GME, associate dean for Student Affairs and an associate professor of Pediatrics in the Division of Academic General Pediatrics and Primary Care and of Medical Education. Photo by Nathan Mandell. “While it may be easy to glean somebody’s achievements by scanning a resume, it’s not so easy to discern their abilities,” Franklin said. “Through thousands of patient interactions, a myriad of student, colleague and co-worker experiences, one of the profound missions of my career has been to help people respect differences in others,” Franklin said. A focus on well-rounded graduates was reflected in many of the awards at Honors Day — including the Neil Stone Award for Professionalism and Compassion in Medicine, which recognizes a student whose commitment to professionalism and compassion was particularly noteworthy. Jessica Sulllivan, ’18 MD, was presented with the Martin Lipsky Award for Excellence in Family Medicine by Deborah Clements, MD, chair of Family and Community Medicine, the Nancy and Warren Furey Professor of Community Medicine and a professor of Medical Education. Photo by Nathan Mandell. Jessica Sulllivan, ’18 MD, was another student recognized during the awards ceremony. 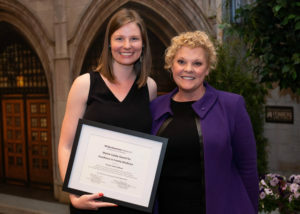 “I was very honored to receive this today,” said Sullivan, who was presented with the Martin Lipsky Award for Excellence in Family Medicine, awarded to the student entering a family medicine residency who most exemplifies the characteristics of altruism, compassion and intellectual curiosity. “These characteristics represent some of the values that are most important to me in medicine,” said Sullivan, who’s moving on to a family medicine residency at Swedish Medical Center in Seattle. Donald R McCrimmon, PhD, associate chair of Physiology and a professor of Anesthesiology, for outstanding teaching in a large-group setting during the M1 year. Kristy Wolniak, MD, PhD, ’09 ’14 GME, assistant professor of Pathology, for outstanding teaching in a large-group setting during the M2 year. Bruce Henschen, ’12 MD, ’12 MPH, ’15 GME, assistant professor of Medicine in the Division of General Medicine and Geriatrics, for excellence in the clinical teaching of medical students. Michael M. Ravitch Award: Tod Chambers, PhD, associate professor of Medical Education and Medicine in the Division of General Medicine and Geriatrics, for outstanding teaching in a small-group setting. Diane B. Wayne, MD, Award: Luke Laws, ’18 MD, for outstanding performance in the junior medicine clerkship. John T. Clarke, MD, Award: Ajay Haryani, ’18 MD, for an outstanding graduating student pursuing a career in internal medicine. Eugene Bauer, MD, Award for Excellence in Dermatology: Sara Fossum, ’18 MD, for the best overall performance in dermatology by a graduating medical student pursuing a career in dermatology. Beatrice Tucker, MD, Award in Obstetrics and Gynecology: Rachel Ruderman, ’18 MD, in recognition of outstanding commitment, service and advocacy in the field of women’s health. Louis G. Keith, MD, PhD, Award in Obstetrics and Gynecology: Susan Duyar, ’18 MD, in recognition of clinical and academic excellence in the field of obstetrics and gynecology. Henry B. Betts, MD, Award for Excellence in Physical Medicine and Rehabilitation: Adenike Adewuyi, ’18 MD, for best performance during the physical medicine and rehabilitation medical student clerkship rotation. Stephen M. Stahl Award for Excellence in Psychiatry: Sai Folmsbee, ’18 MD, for an outstanding graduating student in psychiatry. Edward A. Brunner Medical Student Award in Anesthesiology: Benjamin Chu, ’18 MD, in recognition of the highest level of academic excellence demonstrated by a graduating student pursuing a career in anesthesiology. American Academy of Neurology Medical Student Prize for Excellence: Sarah Brooker, ’18 MD, Awarded by the American Academy of Neurology for a graduating student who demonstrated excellence in neurology during the third-year clerkship as well as the selective experiences in neurology. Jan Reddy Excellence in Pathology Award: Suzanne Schauwecker, ’18 MD, for excellent effort and learning on the pathology elective rotation. Gayle E. Woloschak Medical Student Award for Excellence in Radiation Oncology: Nikhil Rammohan, ’18 MD, for excellence in radiation oncology. James Thomas Case Radiology Award: Andrew Gordon, ’18 MD, for best overall performance in radiology by a graduating student pursuing a career in radiology. Clare Giegerich Award for Outstanding Promise in Orthopaedic Surgery: Charles Cogan, ’18 MD, awarded to a graduating student who demonstrated outstanding performance in the field of orthopaedic surgery. James A. Stockman III Award for Excellence in Pediatrics and Child Health: Jana Shapiro, ’18 MD, for outstanding performance in the pediatric clerkship and a passion for advancing the care of children through advocacy, education and research. John P. Phair Award: Katherine McGee, ’18 MD, awarded to a graduating student who excelled on the infectious disease rotation in both the intellectual and human side of medicine. Julius Conn Jr., MD, Award: Taylor Sutcliffe, ’18 MD, for outstanding performance in the surgery clerkship. Lee M. Jampol, MD, Award: Rebecca Edwards, ’18 MD, for outstanding achievement by a graduating student in ophthalmology, in clinical care and vision science research. Martin Lipsky Award for Excellence in Family Medicine: Jessica Sullivan, ’18 MD, named for the inaugural chair of Family and Community Medicine and granted to a graduating student entering a family medicine residency who most exemplifies the characteristics of altruism, compassion and intellectual curiosity. Society for Academic Emergency Medicine Excellence in Emergency Medicine Award: Aaron Wibberley, ’18 MD, awarded to a graduating student who has demonstrated excellence in the specialty of emergency medicine. James Kozlowski Award for Excellence in Urology: Kevin Lewis, ’18 MD, presented to a graduating student with the most outstanding performance in urology. Paul C. Bucy Medical Student Award: Daniel Oyon, ’18 MD, for outstanding contributions by a graduating student in the field of neurological surgery. Frederick and Harriett Stenn Award for Humanism in Medicine: John Campo, ’18 MD, nominated by a classmate for demonstration of humanism and compassion in the practice of medicine. Neil Stone Award for Professionalism and Compassion in Medicine: Beverly Aiyanyor, ’18 MD, nominated by a clerkship director in recognition of commitment to professionalism and compassion in medicine. Kenneth M. Viste, Jr., ’66 MD, Student Service Recognition Award: Taylor Sutcliffe, ’18 MD, in recognition of outstanding service and contribution to Feinberg School of Medicine. Daniel Hale Williams Diversity and Inclusion Award: Emmanuel Ogele, ’18 MD; Anthony Gacita, ’18 MD; and Emma Gargus, ’18 MD, in recognition of a graduating sudent who excelled at promoting diversity and inclusion at Feinberg School of Medicine. Jonathan Philip Reder Award: Matthew Sullivan, ’18 MD, for outstanding leadership and extracurricular accomplishments by an Honors Program Graduate with exceptional involvement in In Vivo.